José Andrés—the James Beard Award-winning chef and humanitarian who served nearly four million meals to those impacted by Hurricane Maria in Puerto Rico and provided food to federal employees during the government shutdown—brings his passion for food to Vegetables Unleashed, his first cookbook dedicated entirely to vegetables. Celebrating the vibrancy and versatility of vegetables, the cookbook is a new manifesto on how to think about—and eat—the vast universe of vegetables. Andrés shares his belief that vegetables are far sexier than meat and shows how to creatively transpose the flavors of a global pantry onto ingredients that may have been written off as bland. Highlighting the simple pleasures of a beefsteak tomato sandwich and the savory satisfaction of mushroom ramen, Vegetables Unleashed shares the recipes, tricks, and tips behind the dishes that have made Andrés one of America’s most important chefs. 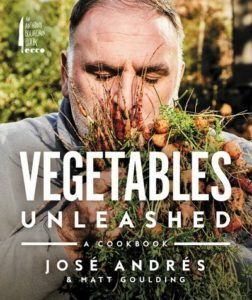 Showcasing Andrés’ wide-ranging vision and borderless cooking style, Vegetables Unleashed also delivers new variations on the food he grew up with in Spain, like vegetable paella and Spanish tortillas. Andrés is the chef and owner of ThinkFoodGroup—with more than thirty restaurants, including the two Michelin-starred minibar by José Andrés—and the founder of World Central Kitchen. In conversation with Joe Yonan, the Food and Dining editor at The Washington Post.